The Meaning of Kyomi is Pure Beauty which suites this little girl down to the ground. She is a Blue Classic Tabby and I would like to thank Yendor Cats and Margaret for this wonderful little girl. Kimie is what she is affectionately called at home. Kimmie is a very playful young lady and runs around the house upstairs and down stairs at a gallop. She knows her own mind and she is indeed growing into a lovely young lady. 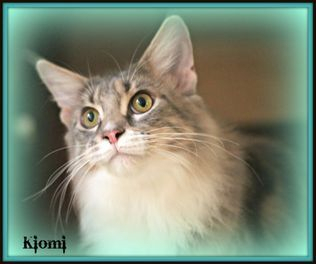 In 2015 Kyomi received runner up Long Hair Entire Cat of The Year. For northern Queensland. In 2016 she has become Entire cat of the year with QFA for the Northern region of Queensland well done Kyomi.